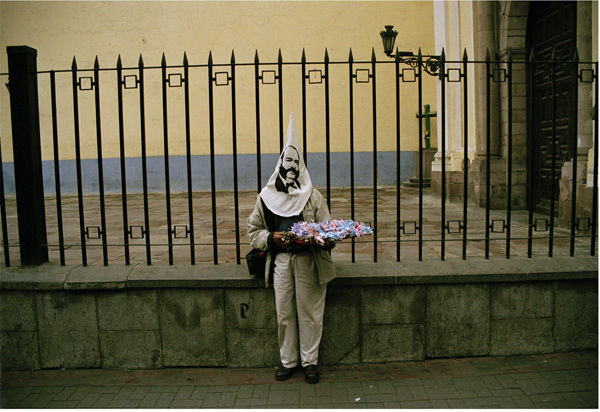 This collaborative photographic performance was executed in Lima - Peru, with Peruvian artist Olga Engelman. The performance consisted of interacting with people in the public space, where the audience chooses from a series of masks silkscreened with the faces of influential Peruvian heroes and popular virgins to wear for the camera. Heroes includes: Almirante Grau, Sta Rosa de Lima, Tupac-Amaro, Bolognesi, Micaela Bastidas, St. Martin, Simon Bolivar, Jose Olaya. Places where we photographed: Miraflores Market, the church of the Virgen del Carmen in Lima, the beach from Morrillos to Miraflores. The following series of photographs are part of a project of documentation of the Nivakle community in the Chaco, as they struggle with their relationship with Mennonite colonists and with the results of climate change. The Nivakle is an indigenous community that inhabits the central Chaco area in Paraguay. This traditionally nomadic community was forced to become sedentary and peripheral to the new Mennonite arrivals. The Mennonites arrived circa 1921 as result of religious persecution in Europe. Historical post-war circumstances in Paraguay generated through the war of the “Triple Alliance” 1864-1870 and the “Chaco war” 1932–1935 depopulated Paraguay. The historical situation forced repopulation of the country and required the acquisition of financial support for reconstruction which was obtained through selling land to Mennonites. As a result three distinctive settlements were established in the Central Chaco. The colonists purchased massive amounts of land, and they established dairy cooperatives and produced dairy derivatives and meat. The Chaco is an extended region north of Asuncion, the capital, with 5 distinctive linguistic families. The Chaco witnessed a dramatic social transformation with the arrival of the Mennonites. A peripheral relation was established, the self denominated colonists relegated the indigenous communities into “barrios obreros” a worker neighborhood. “Barrios obreros”, are delimited areas assigned to the indigenous community, which has resulted in overly populated areas, with consequences in the social fabric and the exclusion of the indigenous and perpetuation of colonial relations. Next to the colony of Neuland there is large “barrio obrero” called Cayin, with a large concentration of Nivakle. Today the Nivakle community confronts multiple struggles, besides social and economical problems and lack of work and access to education; global warming has impacted the Chaco area, altering dramatically the traditional rainy season. As consequence there is a scarcity of water, directly impacting the natural resources available to the community and access to potable drinking water. This series of photographs are part of ongoing research about the Nivakle community. I first established contact with the community from my interest in a series of drawings that three members of the community executed. These beautiful and expressive drawings re-enact past traditions, act as memory, and represent a critical perspective and the struggles of the community. The project has expanded and currently recognizes the traditional art making and craft of the different communities in the Chaco as well as their fragmentation and isolation from each other, and the consequent need of exposure and dialogue as a way of maintaining and supporting their art making. As result of the need of inter dialogue and exchange between communities, there is a plan to construct a mobile museum that travels between the different dispersed communities. comprises a series of large-scale three-dimensional anaglyphs, designed to be viewed through chromatic 3-D glasses. The resulting images depict members of a Japanese animation club in present day Trenton, New Jersey. Inspired by Japanese anime and culture, and dressed in costumes of they designed themselves, these participants role-play and act out fantasy identities. Combining representation and illusion, the photographs examine the gap between identity and representation.